Brent Ruswick. 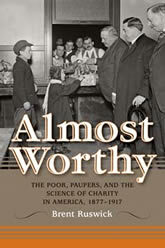 Almost Worthy: The Poor, Paupers, and the Science of Charity in America, 1877-1917. Indiana University Press, 2012. In the 1880s, social reform leaders warned that the “unworthy” poor were taking charitable relief intended for the truly deserving. Armed with statistics and confused notions of evolution, these “scientific charity” reformers founded organizations intent on limiting access to relief by the most morally, biologically, and economically unfit. Brent Ruswick examines a prominent national organization for scientific social reform and poor relief in Indianapolis in order to understand how these new theories of poverty gave birth to new programs to assist the poor.